I have recently returned to civilization from my eighth expedition to Denali [edit: Not recently anymore! This blog post is finally making it online 3 months after the fact…], the highest mountain in North America. 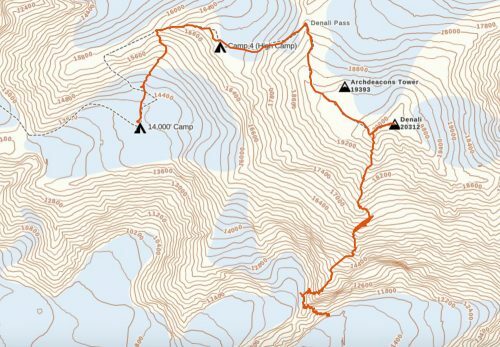 Although the summit of Denali is only 6,155 meters, I think the altitude on the summit of Denali feels roughly equivalent to 6,500 meters in Nepal. This discrepancy is because the centripetal force of our spinning Earth causes the Earth’s atmosphere to “bulge” nearer to the equator (the atmosphere is slightly thinner at latitudes farther from the equator). In addition, Denali’s far northern latitude makes it much colder than an equivalent altitude in the Himalaya or Karakoram – temperatures on Denali are more comparable to 8,000m peaks. 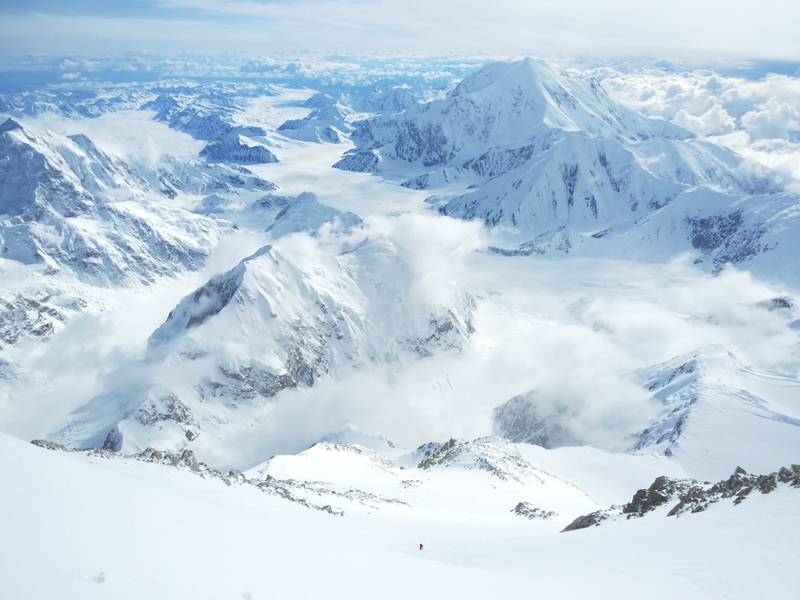 These factors, combined with Denali’s large scale (the south face is nearly 3,000m high), make climbing on Denali an experience similar to that one would find on 7,000m and 8,000m peaks in Asia. 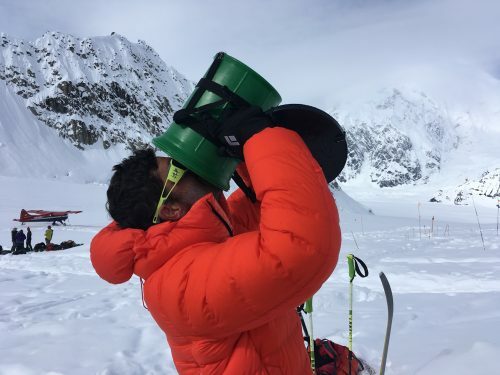 While this sort of experience isn’t for everyone (and nearly everyone is happy to spend some time in warmer, more lush environments after a few weeks on Denali! ), it is valuable to many of us, and rare in North America, as really there is only one other mountain with similar factors (Mt. Logan). While I personally think the fee to climb Denali has crept up over the years to unjustifiable levels, I have continued to return to Denali precisely because it is much more affordable than its cousins in Nepal, India, and Pakistan – places where the national governments keep their high mountains as expensive as possible without deterring too many wealthy visitors. Combined with relatively easy and inexpensive travel to Alaska, Denali provides a great big-mountain experience to North American climbers that is much more affordable than similar mountains in Asia. However, what you save in money you make up for in hard work. In the Himalaya and Karakoram the cost of labor is so low compared to western countries that it is still standard to have all of one’s supplies carried to basecamp by local porters, and sometimes even onto the slopes of the mountain itself. Basecamps in the Himalaya and Karakoram are typically on dry ground, and most expeditions hire a local cook to prepare their basecamp meals. 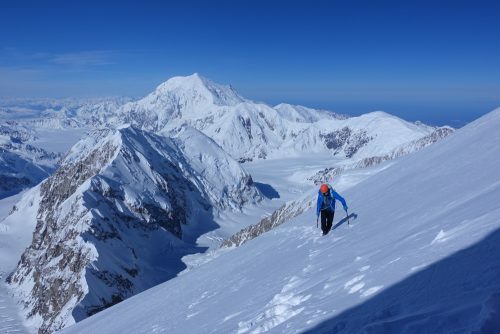 On Denali, on the other hand, pampering is only available to the uber rich, all camps are on snow, all water must be laboriously melted from snow, and all the heavy loads one must carry oneself. In 2003 I finally made my first trip to Denali, skipping my high school graduation in order to do so. I headed up there with a friend from Seattle, Hal Kussick, and like many teams on Denali, our stated goal was the Cassin Ridge, but we never ended up making an attempt. 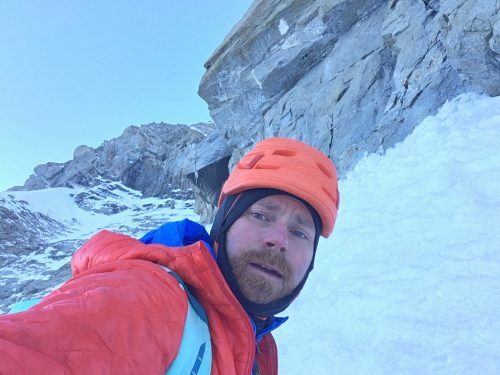 Hal did not feel that he was acclimatizing well, so I went and tagged the top by myself via the West Buttress (the same day that Chad Kellogg set a speed record which stood for many years), and we went home. In 2005 I made my second trip to Denali, again with the Cassin Ridge as the goal, but this time with Scott Johnston. By that time I already had my sights set higher than a traditional ascent of the Cassin, and we planned to climb the route without a bivouac. After both summiting via the West Buttress in 7:30 roundtrip from the 4,000m camp, we rested a few days, and then headed for the Cassin. After down-climbing most all of the lower West Rib, we stopped on a ledge near the bottom of the Chicken Couloir to take a nap and wait for cooler temperatures. During our rest Scott got cold feet (metaphorically) about attempting the Cassin in a single push, so we bailed back up the lower West Rib. Although I was disappointed about Scott’s decision in the moment, I didn’t regret it a few hours later upon discovering that our stove was drastically malfunctioning. I finished our trip with a solo lap on the upper West Rib, this time doing 6:50 roundtrip from the 4,000m camp. My third trip to Denali, in 2007 with Mark Westman, never involved plans for the Cassin Ridge, but was a great success. After some extensive acclimatization (in which I slightly improved my roundtrip time from the 4,000m camp – 6:37), we made the 5th ascent of the Denali Diamond in two days. I returned to Denali in 2010 with Norwegian Bjørn-Eivind Årtun. Our main goal for the trip was a new route on Sultana (and that went down: http://www.colinhaley.com/alaska-2010-dracula-and-cassin-simul-solo/), but we also came for the Cassin Ridge. By this time, even though I had yet to ever climb the Cassin, I had raised my goals in accordance with my accrued experience, and we set our sights on the speed record. 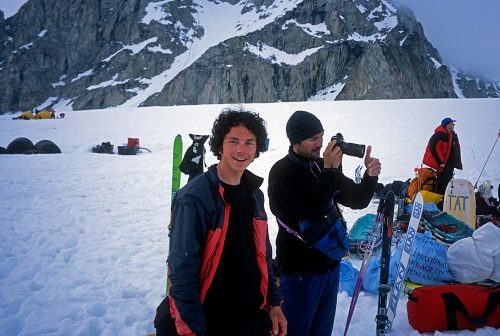 In 1991 Mugs Stump had soloed the Cassin in 15 hours, and 19 years later Bjørn-Eivind and I felt confident that we could go faster, given decent conditions. 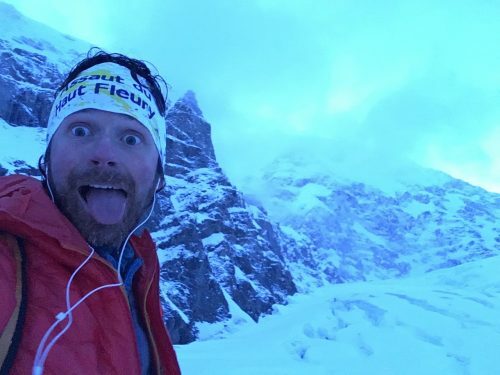 Unfortunately decent conditions were not to be, and Bjørn-Eivind and I topped out after 17 hours, climbing most of the time in bad weather, and wallowing through a huge amount of deep snow. 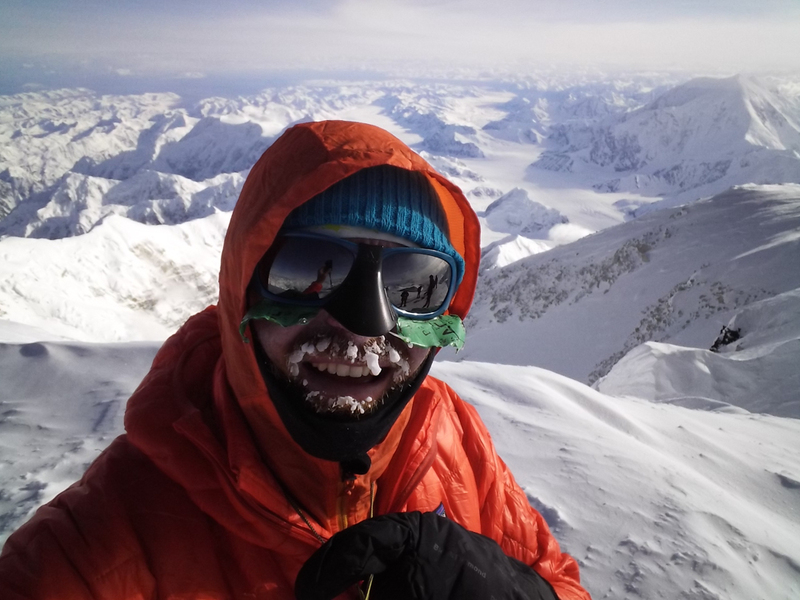 In 2016 I climbed Denali once more while acclimatizing for the Infinite Spur (http://www.colinhaley.com/infinite-spur-laps/), my thirteenth time to the summit of North America’s peak. It’s fair to say I was already pretty familiar with the mountain when I arrived in Kahiltna Basecamp this year! Rob Smith and I began planning our 2018 trip to the Kahiltna several months in advance. The basic plan was that we would attempt the Slovak route together, and afterwards I would stay up on the mountain to attempt a speed record on the Cassin Ridge once more. We both spent the late winter and early spring in Chamonix, which I think is the best place to prepare for trips to big frozen mountains. Unfortunately, my desire to maximize training time in Chamonix ended up being a bit too much. After spending 2 months in Chamonix, I flew to Seattle and had only about 48 hours to pack and prepare for a 6-week Denali expedition. The result is that I flew to Anchorage stressed-out and sleep-deprived, and after spending one night in Talkeetna I came down with some sort of nasty sickness. A couple days later, Rob caught the sickness as well. 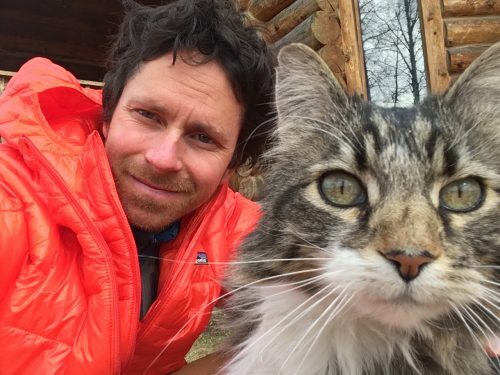 We spent 5 days wasting away in Talkeetna, unfortunately sampling some of Talkeetna’s incredibly overpriced food, but fortunately hanging with our good friend Mark Westman. When there was a brief respite of early-May’s incredibly wet weather, and TAT said they could fly us into basecamp, we decided to go for it. 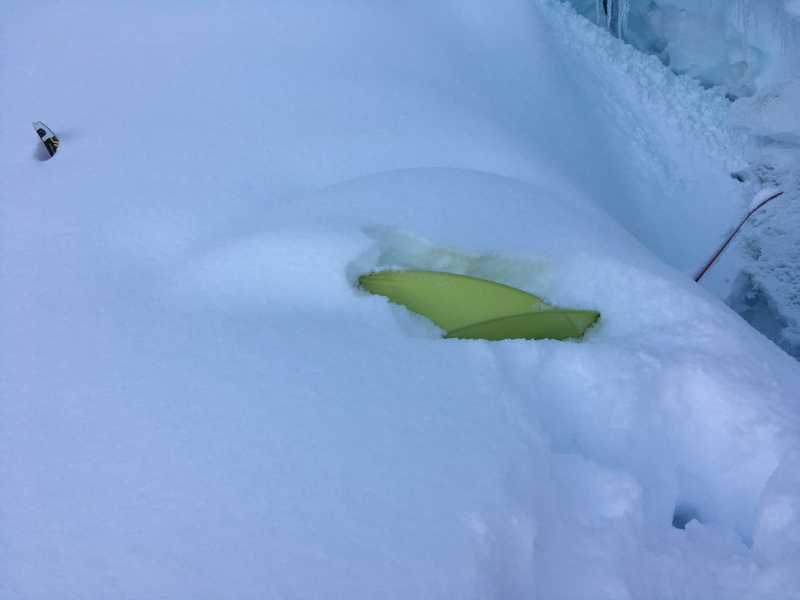 We were both sick, which is far from ideal for flying into the Central Alaska Range, but we were concerned that if we didn’t fly in we might have to wait several more days before the weather was flyable again. 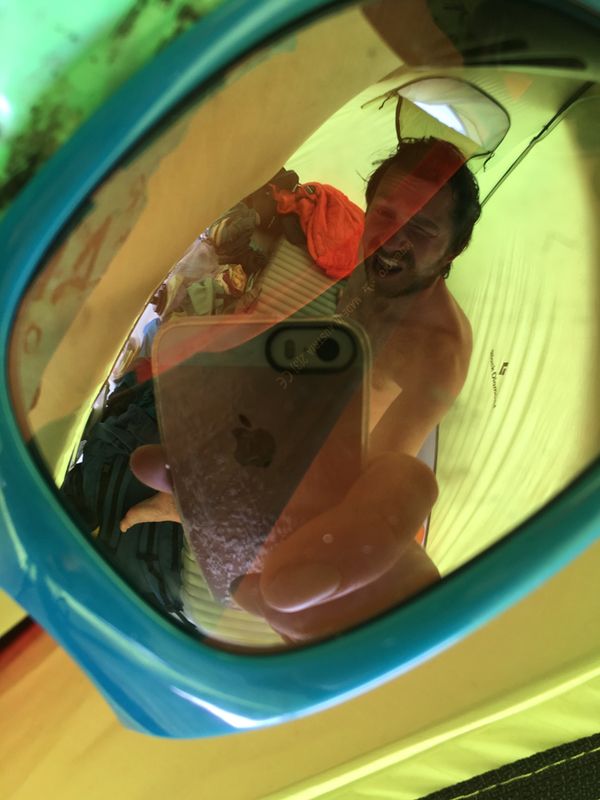 We arrived in basecamp sick, and stayed there for the subsequent week while the weather continued to be terrible. 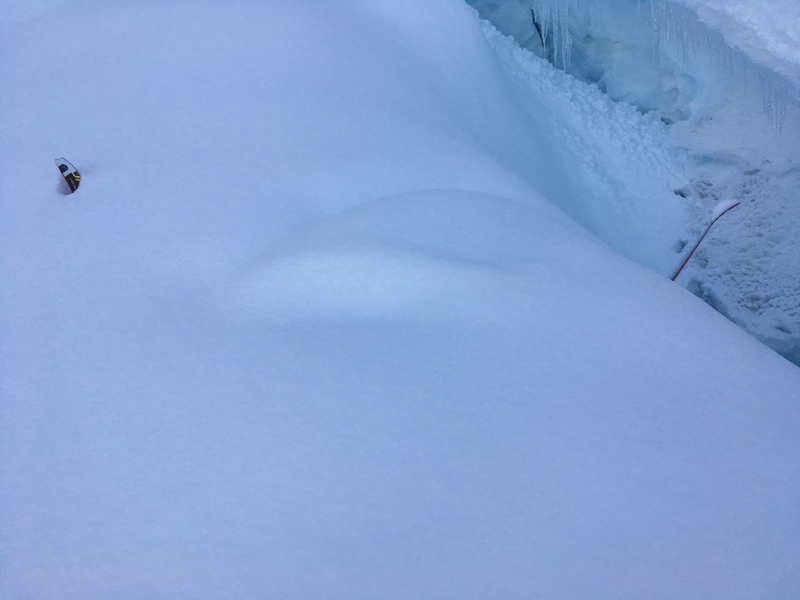 It was a bad start to our expedition, and considering that the Central Alaska Range had received nearly nonstop snowfall for 6 weeks we seriously considered throwing in the towel and trying our luck in the Canadian Rockies or Peru. Finally the weather started to improve, and we started to feel decently healthy. We both had lingering coughs though, so even though we started to take some gear up to the 3,000m camp on Denali we didn’t dare sleep above basecamp, for fear that we might prolong our coughs. When we finally departed basecamp we had lost two weeks of time compared to our original schedule, and we both knew that our delayed acclimatization seriously diminished our chances of pulling off our climbing goals. 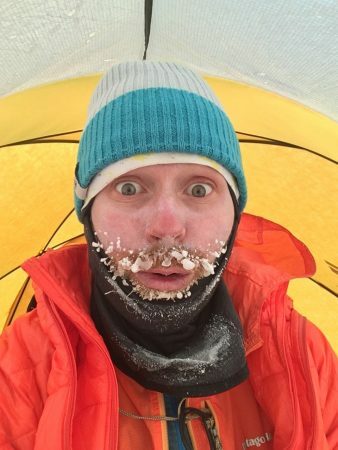 Rob and I slipped into the rhythm of Denali labor camp – hauling loads, melting snow, digging tent platforms, shoveling out the tent, hauling loads, melting snow… After establishing ourselves at the 4,000m camp we made day trips higher on the mountain. I generally like to take my time acclimatizing (headaches are a great way to ruin an otherwise fun climbing trip! ), but we had lost so much time at the beginning of our expedition that we knew we needed to acclimatize as fast as possible if there was to be any chance still of climbing the Slovak route. Rob needed to be home in Colorado on June 8, and it was starting to get down to the wire. At the same time that we started to really feel this time crunch, a forecast of good weather started to appear on the horizon, and we began to discuss and evaluate all sorts of plans and variations of plans. 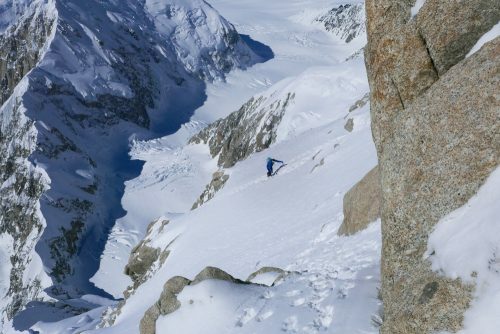 I finally went to the summit on May 31 via the “Orient Express” couloir, and skied back down the same way. It took me 8:31 round trip, which isn’t particularly fast, but seemed not bad for my first trip to the summit, considering that I broke trail from the 4,000m camp all the way to the “football field.” Rob has significantly less high-altitude experience than I do, and he made it just to the football field before heading down. We took one rest day, and headed up high again on June 2, this time via the West Buttress. I carried my skis up to the summit, and skied down via the West Buttress and Rescue Gully. This time I made a roundtrip time from the 4,000m camp of 6:14, my fastest yet. I knew that with more acclimatization and better conditions I could go much faster than that, but I was excited to have done my fastest yet roundtrip time for a different reason: it indicated to me that I was well-enough acclimatized to seriously consider a real climbing goal. Still on June 2, just a handful of hours after my second time tagging the summit, Rob and I packed up some things at the 4,000m camp and skied down to basecamp. Since the beginning of our scheming, Rob and I had planned to attempt the Slovak route without any bivouacs. 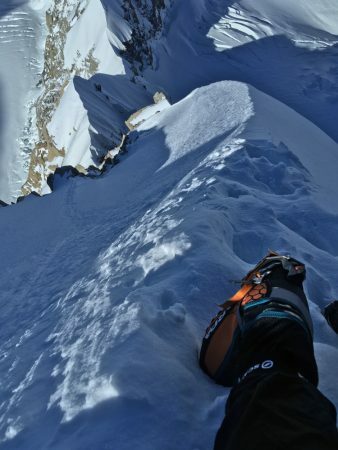 However, I think that for climbing the south face of Denali without bivouac gear, being very well acclimatized is critical for it to not be reckless and dangerous. We had acclimatized for much less time than originally hoped, and Rob had never made it to the summit. All in all, this seemed too far from ideal for my liking. I think a lot of people observe some of my climbing achievements and assume that I kind of fling myself into committing situations without much hesitation. In reality I am much more conservative than many people would imagine, and while I do like to sometimes “push the boat out,” I only do so when the boat has been meticulously prepared and everything indicates that the seas will stay calm. So, on the morning of June 3 Rob flew from Kahiltna basecamp back to civilization. 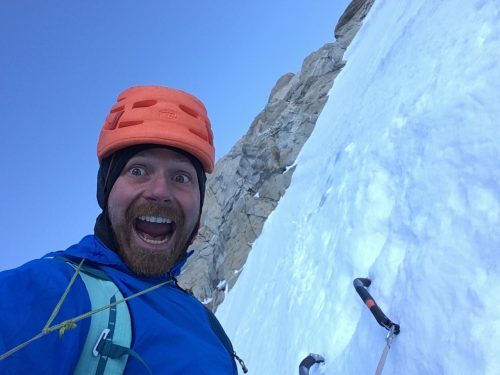 It was a bummer for him to have put in the time on Denali’s West Buttress without getting to climb, but that is simply part of expeditions, especially when one sets high goals. As for me, my focus was immediately narrowed on the Cassin Ridge, and climbing it before any new snow fell. 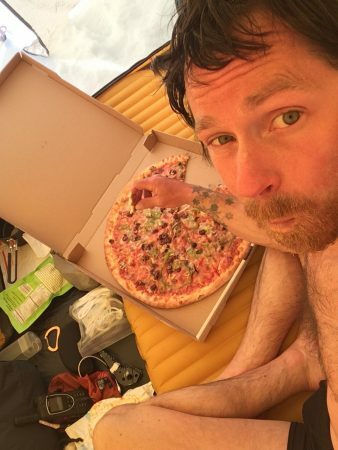 I spent June 3 getting organized and resting in basecamp, aided greatly by a large pizza that Rob kindly bought in Talkeetna and put on a basecamp-bound plane. Somewhere around 10pm I put on a heavy backpack and skied out of basecamp, bound for the south face of Denali. For fear of crevasses, I definitely was not excited to ski up the East Fork of the Kahiltna by myself, particularly as I’d never been in that valley at all before. Fortunately the glacier was in good condition in general (a thick, dense snowpack), the most recent snow was well consolidated, I traveled during the night to ensure the snow would be as frozen as possible, and I was able to mostly follow tracks made a couple days earlier by Anne Chase and Chantel Astorga – All in all, conditions for solo glacier travel in the East Fork were about as good as they ever get. The journey was longer than I expected, however, and it wasn’t until about 4:30am on June 4 that pitched my tent in a bergschrund at about 3,300m, below the slopes of the original start of the Cassin Ridge. On June 4 I slept in, rested, and examined the slopes above me. I had decided to do the original start of the Cassin Ridge from the East Fork of the Kahiltna, rather than a more typical modern approach up the Northeast Fork or down the Seattle Ramp. I had made this decision mostly because I thought it was the best combination of safety and efficiency for a soloist, as both the Northeast Fork and the Seattle Ramp involve pretty real crevasse hazard. In hindsight, however, I think approaching by the Seattle Ramp would’ve been the best choice, because it had tracks from multiple parties on it (which I wasn’t aware of). On June 5 I woke up at 5am, ate breakfast, and at 5:57 I crossed the bergschrund just above my tent and started climbing up the original start of the Cassin Ridge. These slopes to gain the crest of the ridge looked intimidating from down on the glacier, but fortunately turned out to be easy terrain all the way up to the ridge, and I passed some old relic pitons and bits of fixed rope along the way. 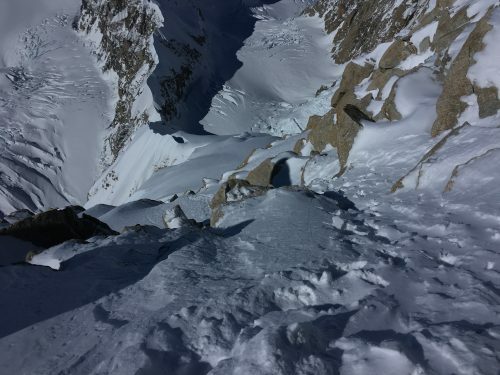 I reached the crest of the ridge at 7:00am, and then spent about 30min making a downward traverse across 50 and 60 degree ice slopes to the base of the Japanese Couloir. 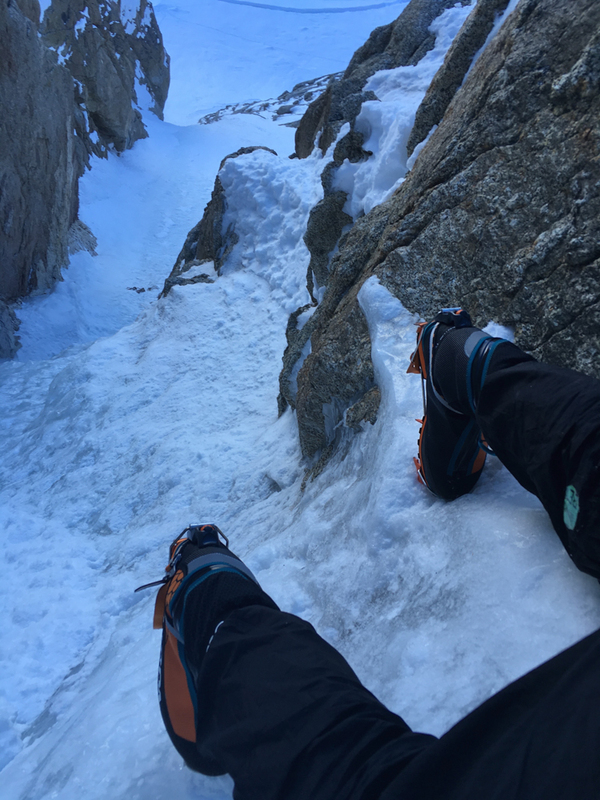 I could’ve actually stayed above the bergschrund and traversed directly into the Japanese Couloir, but I decided to downclimb about 15 meters and below the bergschrund for 2 reasons: First, I wanted to take a nice relaxing rest on flat ground before starting up the route proper. Also, the bergschrund below the Japanese Couloir is where previous speed records on the Cassin Ridge have been measured from, so I wanted to start counting from the same place. Above the Japanese Couloir is the single most difficult pitch that one normally climbs on the Cassin Ridge. Fortunately it felt much easier than I remembered it, and by something like 8:50am I was climbing the “knife-edge ridge.” In the previous days 3 parties had climbed up this ridge, and they had made excellent tracks. Unfortunately, the night before my climb there were a few hours of strong wind and heavy snowfall. I think the total accumulation in most places was only about 5-10cm, but combined with the wind it had wrecked havoc on what otherwise would’ve been an amazing track. While climbing the knife-edge ridge in some places I still had an excellent track, which helped me immensely, and in other places the track wasn’t visible at all. At about 9:20am I reached the base of the “hanging glacier” and took another quick break to eat and drink. Going up the hanging glacier I was again greatly aided in some places by the tracks, and completely unable to find them in other places. At 10:04 I reached the bergschrund at the top of the hanging glacier and had an unexpected encounter with Priti and Jeff Wright, two friends from Seattle who were just packing up from their bivouac there. In the first and second rock bands I again alternated between sections of very helpful tracks, and sections where they were too covered to find. The first and second rock bands have essentially no sustained difficulties, but a long succession of short bits of mixed climbing – all pretty easy, but usually just tricky enough to keep you on your toes. 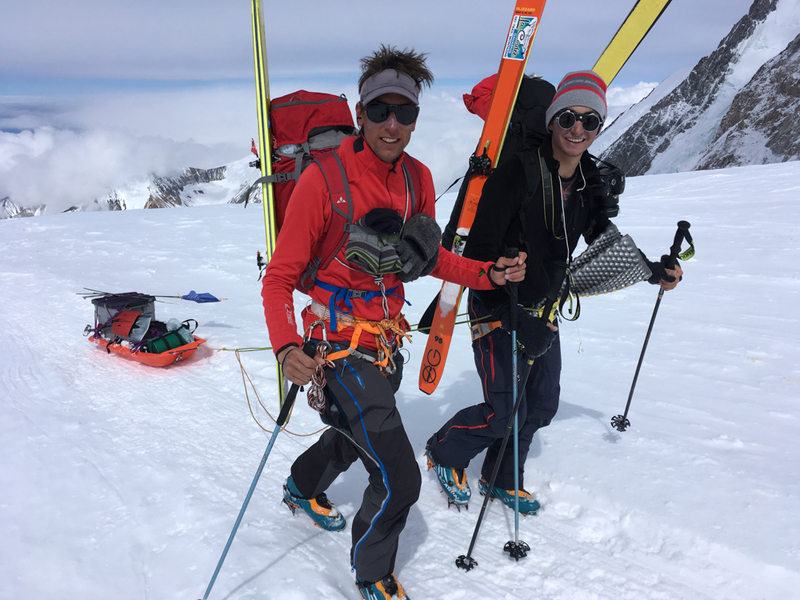 At 11:44, nearly to the top of the second rock band, I ran into two guys from Chile, Nicolas Gantz and Felipe Bishara, who, like Priti and Jeff, had just recently finished packing up their bivouac from the night before. We chatted for a minute or two, and then I headed up where I could see some tracks going. This was a pretty major route-finding mistake. I realized afterwards that if I had gone to the right I would’ve climbed very easy terrain, but instead found myself negotiating a pretty difficult mixed crux. If I had been there alone with no tracks I would’ve surely gone to the right, but in my haste to make good time I simply followed the tracks rather than think about the route finding for myself. Fortunately I made it through this crux pretty quickly, but it was by far the most difficult climbing I did, requiring total concentration to do safely without a rope, and totally out of character with the rest of my experience, which was totally relaxed free-soloing. At 12:26 I was on top of the second rock band, and took a short break to eat, drink, and swap my ice axes for ski poles. At 1:12pm the tracks I was intermittently following joined with Anne and Chantel’s tracks, who had clearly finished the technical portion of the Slovak Route. This was a great boon to me, because Anne and Chantel had passed this point earlier in the same day, rather than the day beforehand, and thus the tracks became much better than any point on the route up to this point. I caught up to Anne and Chantel at 1:59pm, and chatted for a couple minutes while drinking some water and consuming my last energy gel. This was at something like 5,300-5,500m, and I felt there was no longer much mountain left to save my energy for, so I started pushing myself a bit harder. 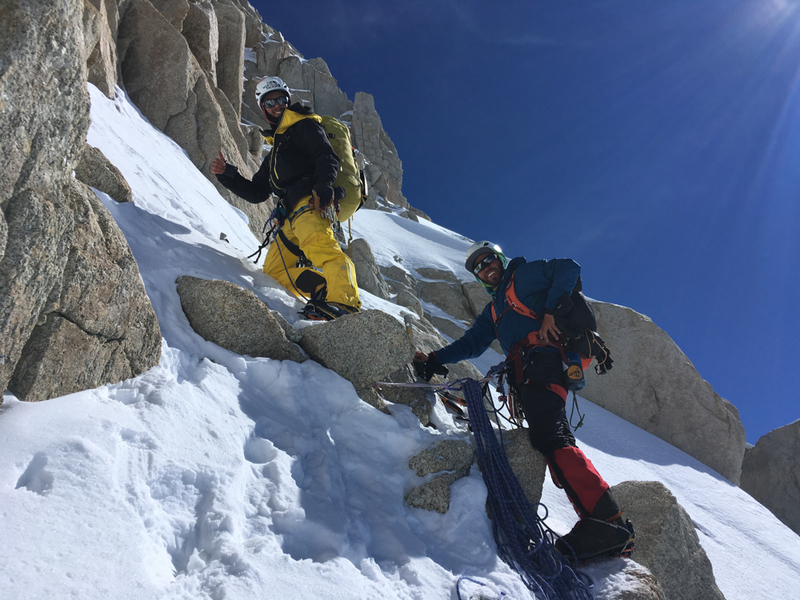 At 3:33 I arrived on the summit ridge, where the Cassin joins with the standard West Buttress route. Here I ran into Jim and Jake, the first of the three parties that had started up the route before me. They had arrived on the summit ridge a bit before me, and were melting snow when I arrived. We chatted for a couple minutes, and then I continued up the summit ridge. At 3:47 I reached the summit of Denali, 8 hours and 7 minutes after crossing the bergschrund at the base of the Japanese Couloir. I hung out for only about 6 minutes, and then started trudging down the West Buttress. Since my goal from the beginning was to set a fast time on the ascent itself, I relaxed totally on the descent, and took my time. I didn’t even note exactly what time I got back to the 4,000m on the West Buttress (where I had left a full camping setup), but I think it was somewhere around 7:00pm. 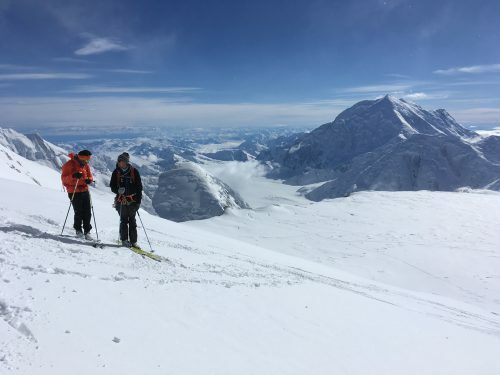 At the base of Denali’s south face, at the head of the East Fork of the Kahiltna, I had left not only a full camping setup, but also skis, ski boots, skins, and a satellite phone. Despite being very tired from my ascent of the Cassin, I was very eager to ski back up the East Fork as soon as possible, before new snow fell (and therefore be able to follow my earlier tracks). This, however, was not to be. Just a few hours after I had returned to the 4,000m camp it started snowing very heavily. On June 6 I packed up everything at the 4,000m camp and skied down to basecamp with an atrociously heavy backpack. 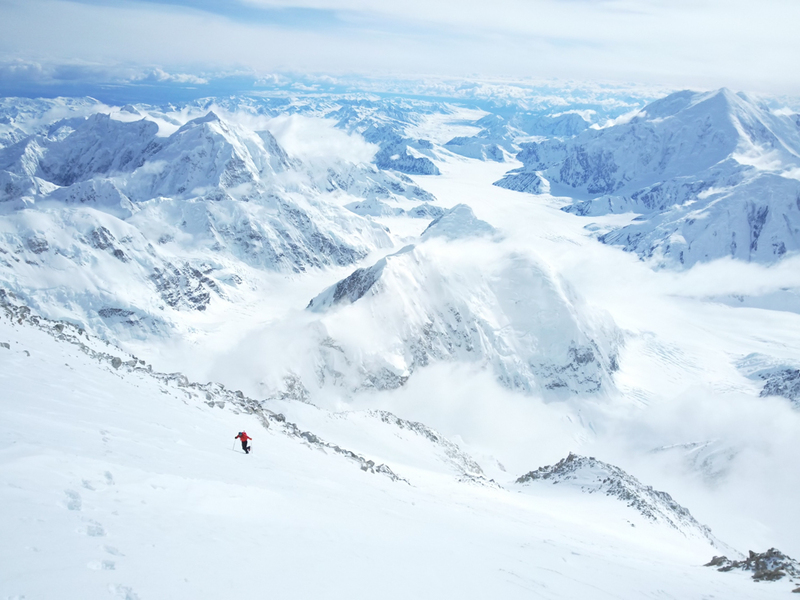 The next day I tried to find someone I could bribe to ski up the East Fork with me, but to no avail – pretty much all the fit climbers I knew in basecamp had just climbed the south face of Denali as well, and were too tired. I accepted that I’d have to do it by myself, and headed out around 10:00pm feeling pretty apprehensive. As I gained altitude up the East Fork, the accumulation of the post-climb storm became deeper and deeper, until I was breaking trail through about 40cm of new snow. Skiing up the East Fork by myself with a bunch of fresh snow on the glacier was the scariest part of my expedition, and in many places I went well out of my way to take the most conservative possible route. I finally reached my nearly-buried tent just before 4:30, very relieved. I packed up my camp, skied back down to basecamp, and a couple hours later was on a Talkeetna-bound plane, very exhausted. In my experience, speed climbs are a controversial subject. Some people think they’re awesome and inspiring, and other people think they are lame and trivial. Personally, I find them to be super fun and an interesting challenge. Certainly speed climbing is something I think about only for objectives that aren’t very difficult for me otherwise, but in those cases I feel like the challenge of going faster gives such a climb a new dimension and makes it much more exciting and engaging than it would be otherwise. In the case of the Cassin Ridge I was very satisfied with my climb, mostly because it was a project I had put so much time into over so many years. 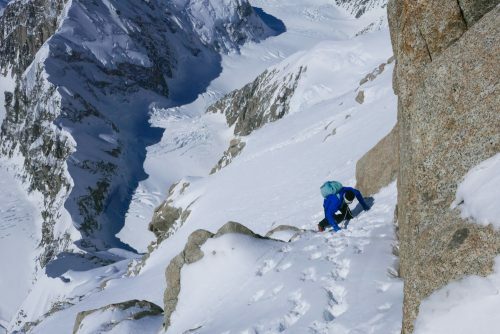 In alpine climbing, conditions always make a world of difference. 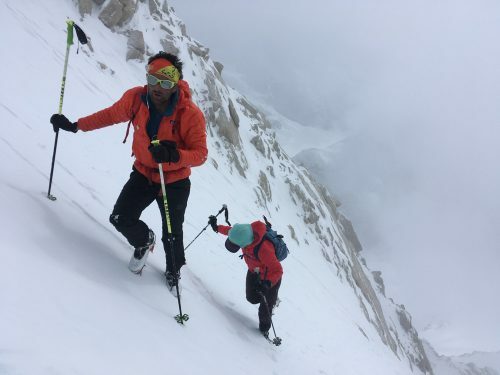 On a route such as the Cassin, where a huge amount of the route is less than 60 degrees (and therefore holds sticky snow), conditions play an even bigger role than typical. There is no doubt that excellent conditions played the biggest role in my time of 8:07. By “excellent conditions” I am mostly referring to the tracks made by other parties. If it hadn’t snowed 10cm the night before my climb, I think the conditions would’ve been “perfect” rather than “excellent,” and in that case I think I probably could’ve managed a 7 hour ascent. Compared to my attempts at a Cassin speed record in 2010, 2011, and 2012, my tactics this time were more refined. The biggest difference is that I decided to make a full bivouac near the base of the route. 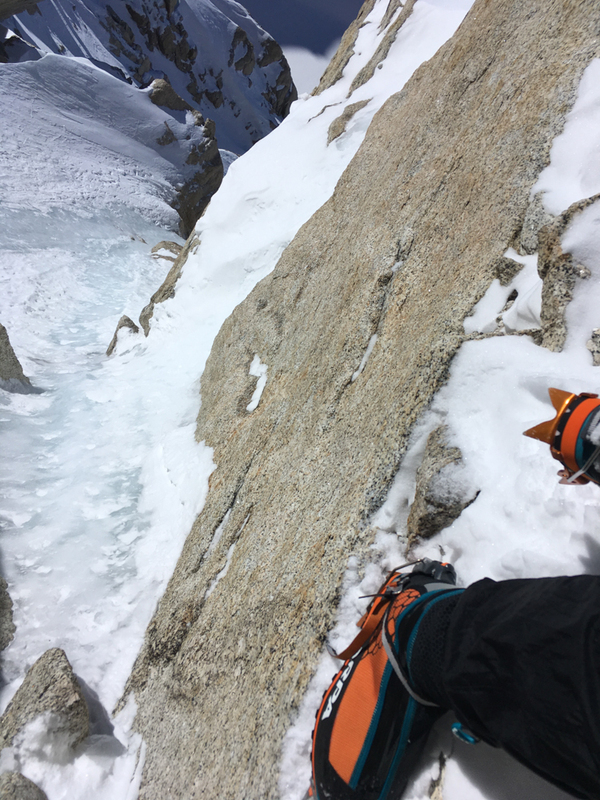 In previous years I wanted to avoid having to return to the base of the route, and thus departed from the 4,000m camp on the West Buttress with a day pack, and stopped near the base of the route only to melt snow for a while. Sleeping near the base resulted in me being more well rested when starting the route. 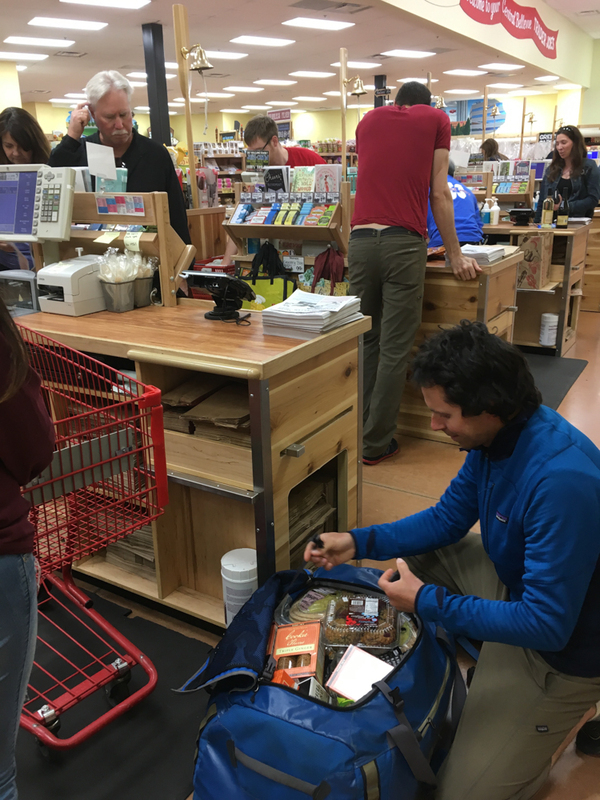 The other significant difference in tactics is that in previous years I always stopped to make a freeze-dried meal halfway up the route – something that I eventually realized was a big waste of time. Obviously speed-climbing the Cassin Ridge is largely a cardiovascular challenge, so better fitness translates pretty directly to a faster time. 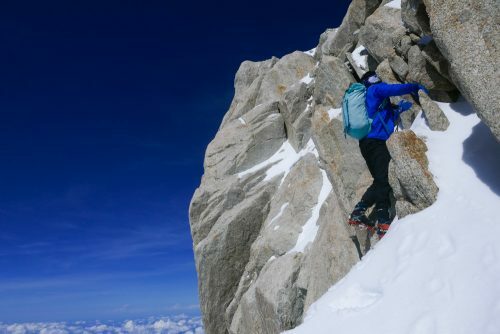 Even though most of the Cassin Ridge is technically easy, there is enough technical climbing that how quickly one moves on it makes a noticeable difference. My technical climbing abilities are higher now than they were in 2010, 2011, or 2012, and that allows me to climb a bit more quickly through the technical difficulties, while still maintaining a high safety margin. Compared to my previous attempts, my crampons, ice axes, helmet, umbilicals, and clothing were all lighter weight. Also, this time I carried single boots rather than double boots, and no stove. This time I brought ski poles for the upper mountain, which I think made me more efficient on that lower-angle terrain, and their total weight was only 230g. I’m quite proud to now hold speed records on what I consider to be the 3 grandest faces of the Central Alaska Range: south face of Denali (8:07), north face of Begguya (7:47), and south face of Sultana (12:29). 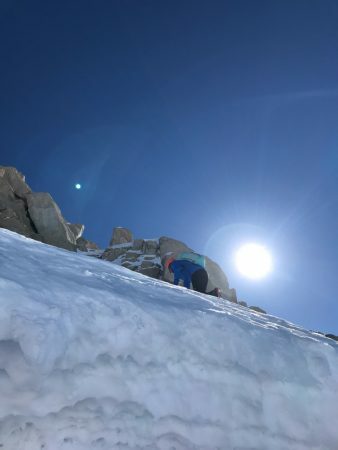 While I definitely am proud of my Cassin Ridge speed record, and while it has garnered significant attention (being a very famous route on a very famous mountain), it is, without a doubt, the climb I am least proud of among these three. The truth is that in the 21st century, a solo ascent of the Cassin Ridge is not all that impressive in and of itself, so the only unique aspect of my recent climb is the speed in which I did it. By contrast, my ascents of the north face of Begguya and south face of Sultana were the first times either face had been climbed solo, and were big, serious adventures into intimidating terrain with no other climbers on the mountain. 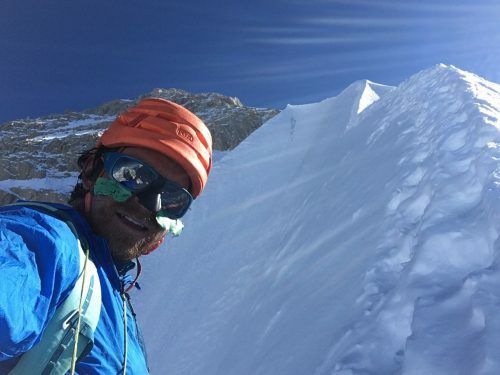 I would be extremely proud of my solo ascents of the north face of Begguya and south face of Sultana even if they weren’t speed records – In fact, I would be very proud of those ascents even if I had taken 5 times longer to climb them. In Kahiltna basecamp after my first time climbing Denali, in 2003. Behind me is Forrest Murphy, who with Mark Westman had just made the third ascent of Begguya’s South Ridge. Photo by Mark Westman. You know you’re doing some serious grocery shopping when you bring the 120L wheeled Black Hole duffle into Trader Joe’s! Photo by Alisa Owens. Sick in Talkeetna, but fortunately getting some quality time with one of the all-star employees of Talkeetna Air Taxi. Rob seeking alternative remedies to our sickness. 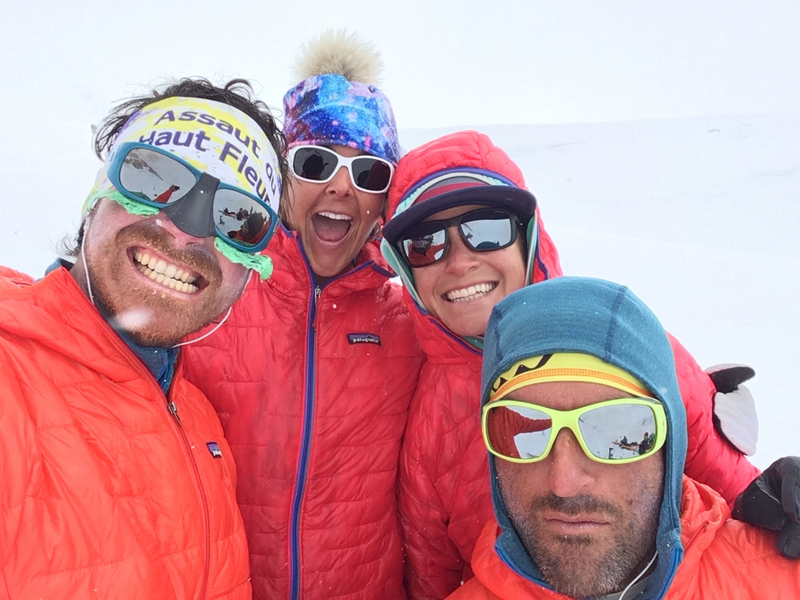 Rendezvous with Chantel Astorga and Anne Gilbert Chase, while hauling loads up to the 4,000m camp. Joseph and Jordi displaying excellent French teamwork, hauling loads up to the 4,000m camp. Rob and Joseph Hallépée doing some skiing above the 4,000m camp. 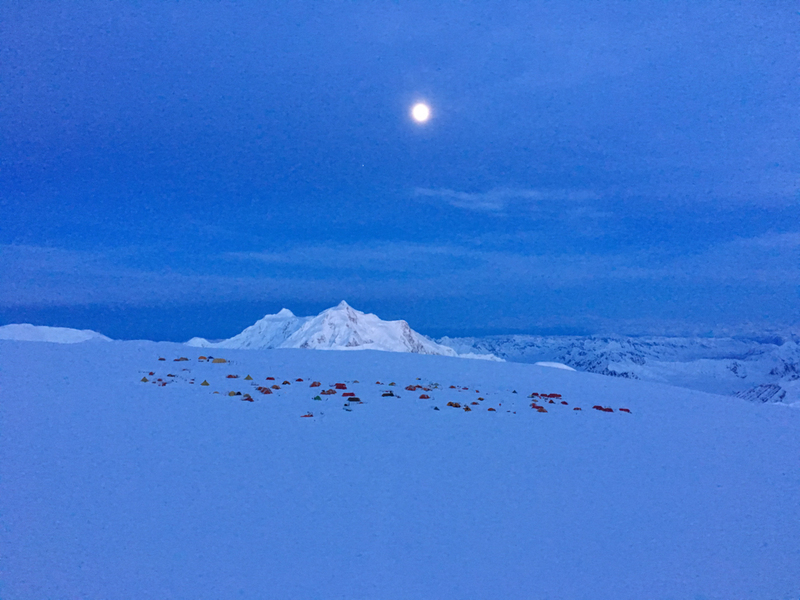 Denali’s 4,000m camp at night, with Sultana behind. Rob and Anne Gilbert acclimatizing on the Upper West Rib. Colin and Rob, aka “Team Romance Explosion,” acclimatizing on the Upper West Rib. Photo by Anne Gilbert Chase. 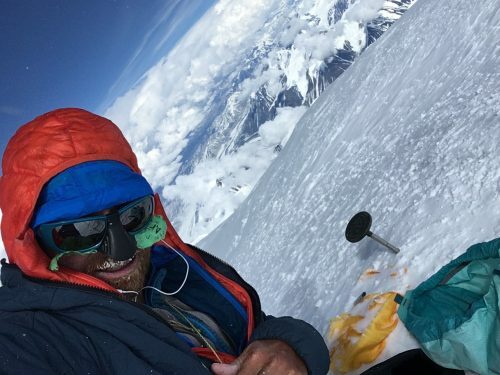 On Denali’s summit for my 14th time, and first time of the expedition. Who wants a mustache ride? Back in the 4,000m camp after my second time of the expedition on Denali’s summit. Fueling up on pizza in Kahiltna basecamp. Thanks, Rob! Seeking shelter from the sun while resting the afternoon before climbing the Cassin. Starting up the Cassin Ridge original start, from the East Fork of the Kahiltna Glacier. Ready, set, go! Selfie at the bergschrund, about to start up the Cassin Ridge proper. Some ice steps in the Japanese Couloir. Looking down the Knife-Edge Ridge. Selfie part way up the Knife-Edge Ridge. Arriving at the top of the Hanging Glacier. Photo by Priti Wright. Starting up the First Rock Band. Photo by Priti Wright. Looking down in the First Rock Band. Near the top of the Second Rock Band. Photo by Nicholas Gantz. 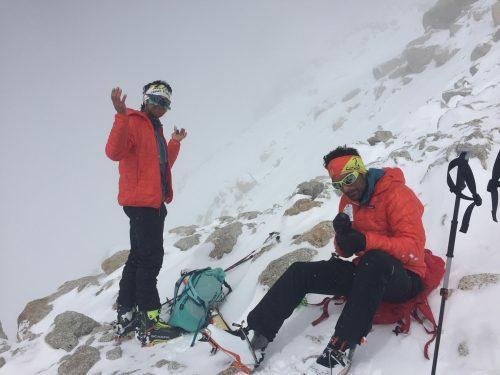 Chilean climbers Nicholas Gantz and Felipe Bishara psyched for the day ahead! 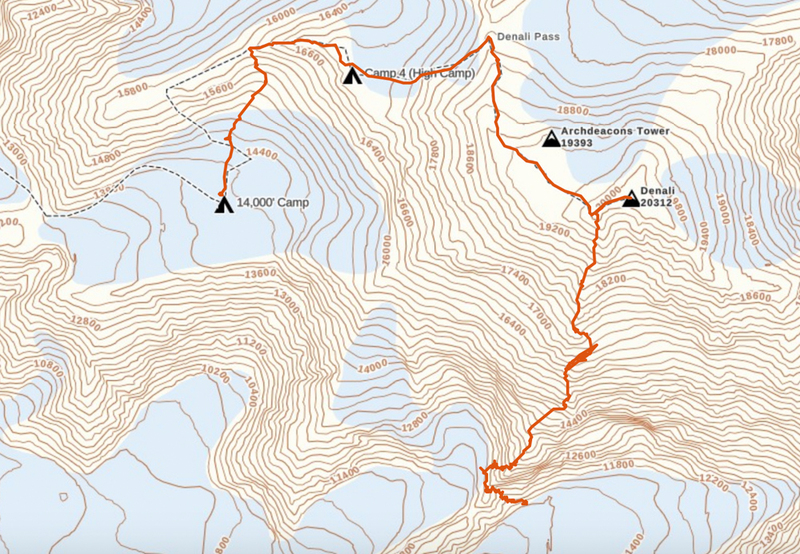 Heading towards the dihedral up and left – A route-finding error that would involve the most difficult terrain on the entire ascent. Photo by Nicholas Gantz. On the summit of Denali for my 16th time, and 2nd time via the Cassin Ridge. Stopping the clock 8 hours and 7 minutes after crossing the bergschrund at the base of the Japanese Couloir. A screenshot of the GPS track that I made on my iPhone, starting when I left my bivy on the East Fork of the Kahiltna Glacier, and ending when I returned to the 4,000m camp. I have no idea how easy it is for tech-savvy people to fabricate a fake GPS track, and therefore if it’s of any use as evidence of an accomplishment, but anyways, here’s a link to the track. Skiing back up the East Fork to retrieve my camp.